Something was moving in the house; he could hear it. His tail twitched slightly as he lay on the couch and kept his eyes closed. The sound was quiet. Perhaps it was a mouse, but he didn’t think so. The last mouse had been weeks ago; since then they had stayed away. His reputation had gotten around. But if it wasn’t a mouse, what could it be? It was an unusual noise, yet it was also vaguely familiar. Rather than the chittering and scurrying of a small animal, it was slow, deliberate, and very soft. The fur on his back rose slightly as a chill filled the air near him. He remained motionless, allowing only one eye to crack open just a little bit. At first, everything seemed normal, nothing out of place. Then he caught sight of a shadow nearby that couldn’t be coming from any object in the room. It did not belong. For several minutes, he watched it as it remained in one place. When it finally began to float away, he pounced. The shadow thing moved faster than he expected, and he misjudged the jump. He managed to rake it with one paw before crashing into the lamp on the small table next to the couch. The cry of pain from the creature was high-pitched and loud. The wail didn’t frighten him, though; he simply wanted to silence it all the more. Looking around the room from where he had landed, he couldn’t see the shadow any longer. However, he could still hear it. The wailing had stopped, but it was still moving. He dropped quietly to the floor and began silently stalking it. Up the stairs and into the unlit bedroom he went, all the while being careful not to make a sound. He couldn’t separate it from the background darkness in the room, but he wasn’t looking for it anyway. He could feel the cold and follow it easily. His own black coat gave him the same advantage. The feeling led him to the corner. He leapt, grabbing the shadow with this teeth this time. It tasted vile. Definitely not food, but also not welcome. It thrashed and cried out again, breaking free from his bite. It sped down the stairs, but he followed immediately, refusing to let it out of his range once more. Back into the living room, he jumped onto the coffee table, knocking coasters and the television remote off. He sprang toward the shadow, which tried to evade his attack. It failed. Trapped in his bite, he dragged it down, ripping into his front claws. 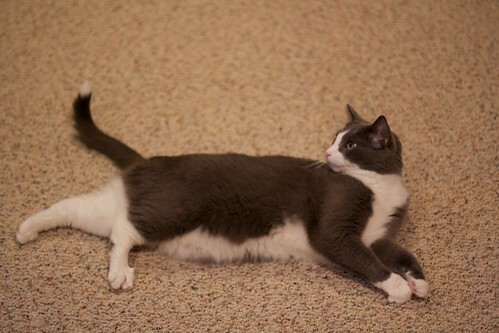 On the floor, he rolled, now using his front paws to hang on to it and his back claws to continue tearing. The wailing was worse this time, but he ignored it. When it finally stopped struggling, he gave it a few more kicks and let it go. The thing didn’t move again, and after a few moments, it dissolved without leaving any trace. It was gone, he knew, though he still wasn’t sure what it had been. At least the intruder had been eliminated. Tired from the hunt, he jumped back onto the couch, turned twice to make sure nothing else was present, and curled up to sleep. When the bigger ones returned, one of them – the louder of the two – seemed upset about the lamp and coasters, but he was too sleepy to get up and pretend to be bothered by its scolding. So I got an early Christmas present. Canon’s EF 50mm f/1.4 USM lens. I had been lusting after this lens for awhile. I will admit, however, that I wasn’t sure what difference the lens would really make. Of course, this is because I’m still an infant when it comes to photography. Of course the person behind the camera matters, but equipment matters too. And I should know that. Shamatha was on the back the chair in the living room. 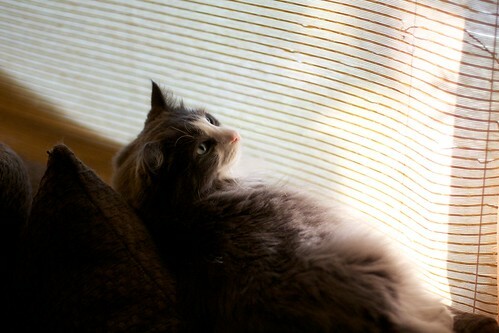 The setting sun blasting light through the blinds illuminated his pink nose. I was taken by the clarity of the shot. The f/1.4 let me take a pretty clear picture in low light without a tripod. I was happy. There’s not much special about this photo, but I always feel guilty when I post pictures of my cats and leave someone out. 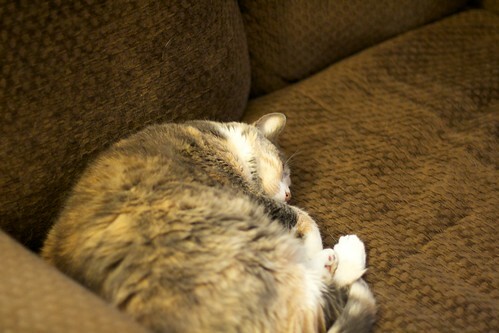 So here’s Bishop, my old girl, sleeping on the chair. This is the shot that blew me away. I’m not saying it belongs in a museum. I’m just saying… “Holy cow! That came out looking great!” I can’t remember ever getting that sort of picture before. Maybe I’m doing stuff differently after all my practice, but I have to think the lens helped. So I’m pretty happy with my new lens. Now I just have to wait for a cool down to go outside and try my hand at some nature shots.